Last year I came across an album of catches at Baviaanskloof. 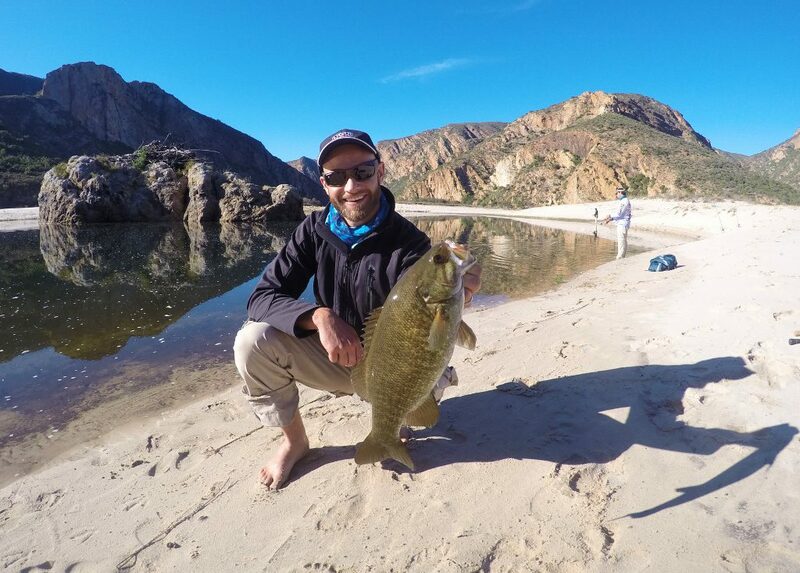 Immediately, as I went through the photos, I was amazed at the quality of smallmouth bass caught at this venue as well as the amazing scenery of this venue. Naturally, this was venue was added to my bucket list of venues that I need to fish – it just looked so damn incredible! At the beginning of this year Evert and I organized a braai so we could discuss some of the trips which we plan to do this year. We had do decide between fishing Letsibogo again or maybe taking on the long journey to the mysterious Baviaanskloof. We discussed it a bit and decided to venture into the unknown by taking on Baviaans. Throughout the year we contacted a few friends which have fished this venue before to do some research on what we could expect when fishing the venue. I thank each of the friends that assisted us with their insights – you guys rock! I must admit that I had absolutely no clue about this venue except knowing that it holds some very good smallmouth bass. As I did some research I found out that we would be fishing in the Kouga River and Dam. I also found out that the venue holds very big catfish, carp and blue kurper. Spotted bass and largemouth bass are also found in the system, although smallmouths are the most abundant in the system. In the small streams that feed the river one can find cape kurper, cape galaxias and redfins. 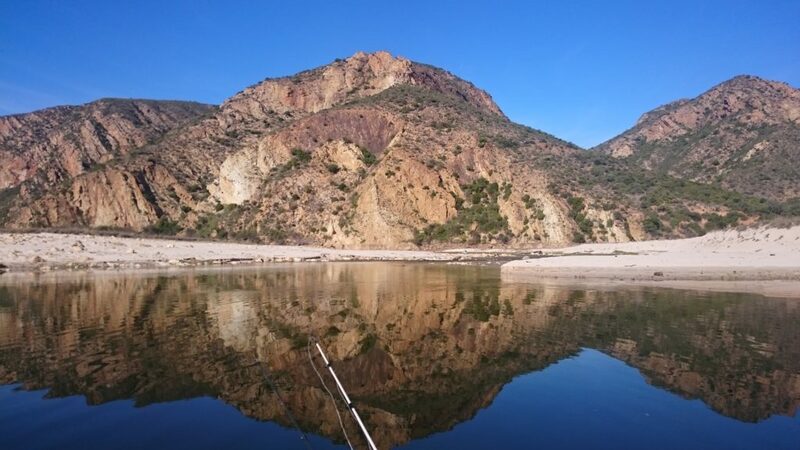 This would be the first time I fish in freshwater in the Eastern Cape and by fishing this venue I would achieve one of my life goals of fishing in each of the nine provinces of our beautiful country. Ironically, I have a kind of love-hate relationship with smallmouth bass, yet I was willing to travel 16 hours to catch them. 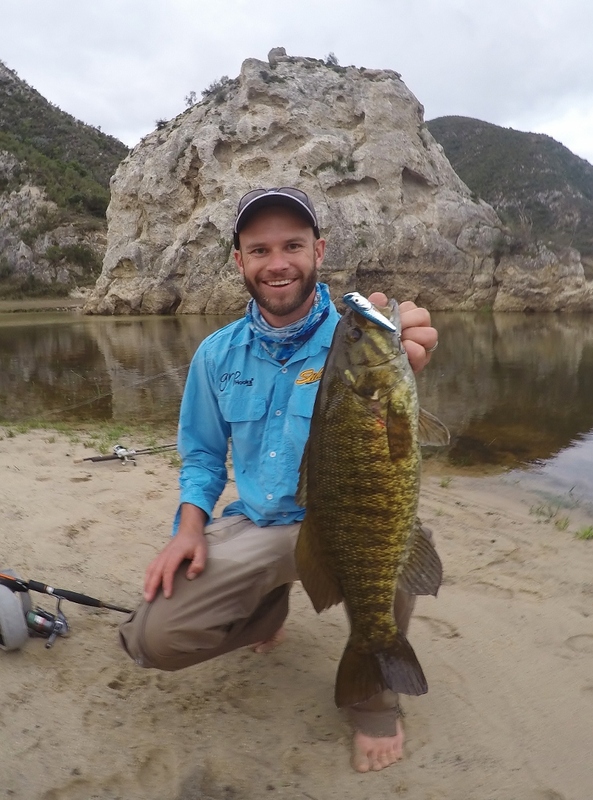 I have caught a few smallmouths in the past in KZN, Mpumalanga and in the Western Cape, but nothing bigger than 1 kg. 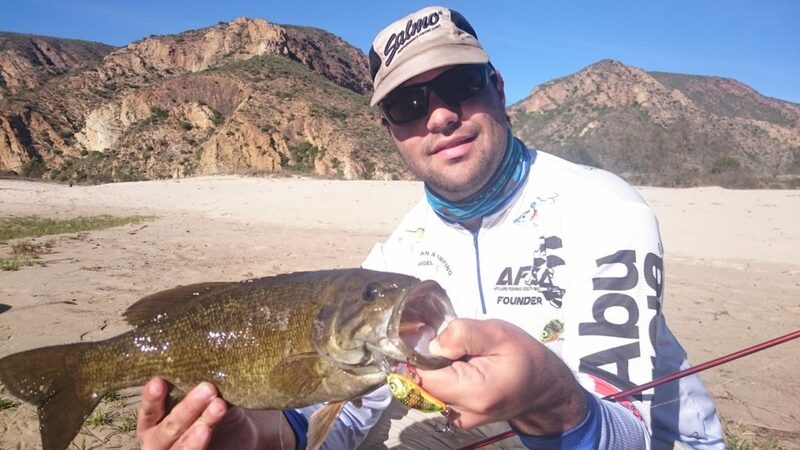 Though I love the way these fish fight (much better than largemouth bass in my opinion), I dislike the species a bit as they have done tremendous damage to many indigenous species in the Western and Eastern Cape. Anyways, the plan with this trip was to see if I can break the 2 kg mark for this species. Evert and I were joined by our two good friends; Francois Nel and Shaun Fredriksson, for this exploratory trip. We were excited to fish this new venue and try out some of our Salmo Lures on the smallies, as we suspected they would work for these fish, but we needed to see for ourselves if they could do the job. Our plan was to do a 5 day trip (drive down in one day, fish for three days and then drive back in one day – must say it was a bit ridiculous to take on such a long drive in one day, but hey we are still young). A few days before we would hit the road for this trip, we received mixed feelings from different angler regarding the trip. Seeing that the dam was very low (where it is usually more than 80% full, it was now standing on 64%) at this stage, this made us wonder if there was enough water for us to fish. The dam is closed for bass boats, so anglers are limited to fish the area close to the camp site. We decided to go ahead with our plans and take on this venue – warts and all! We camped at Doodsklip Rest Camp which has a pretty big pool in front of it which apparently always produces a few fish. Upstream is from Doodsklip is another rest camp by the name of Rooihoek. From Pretoria to Doodsklip it takes about 13 hours (via N1). The road in the park is terrible, a 4×4 is required and it takes between 2.5 to 3 hours to travel from the gate to the rest camp. It is best to fish the venue when the dam level is higher (80% +) as there is just much more water to fish, with the low water, we were restricted to fishing small pools which are far and few in between. This is an extremely physical trip, you do a lot of walking and the terrain is rough – all of us came back with a few injuries. It helps to take inflatables with trollingmotors with to fish the dam, though it is a major mission to pull the boats back to camp as you pull against the current and spend most of the time walking in sinking sand. Most of the river in the area we fished was less than 40 cm deep, there were very few pools that held fish and the fish were limited in most of the pools, except for Doodsklip which held more fish than we expected. Everywhere you walk there is leopard and buffalo tracks – this is wild country, you need to be very cautious when walking next to the river. We even came across two baboon carcasses which we suspect was leopard kills. Doodsklip Rest Camp has a tidy long drop toilet, that’s it – you need to bring all the other things you need with. After a super long drive that took forever, we arrived at the camp site. To our surprise, our camping space was taken. A big tree fell over and blocked off one of the camping spots. As it was around 9 pm when we arrived at the rest camp, we decided to take the only remaining camping spot. It is a shame that we missed out on the spectacular view as we drove down the kloof, I’m sure that it must be a sight to behold in daylight. Unfortunately for us, we also missed this sight when we left for home as we once again drove up the Kloof during the night. It is strange to think that as you drive down the Kloof the flora looks very much like Knysna, but once you arrive at the camp site in the Kloof, it looks like you are in the Kruger. That morning we were greeted with crystal clear waters, next to amazing rock structures and white beaches next to the river. The surroundings look surreal; all of us can agree that we have never seen any place that looks similar to this place – truly something special! I think the fact that this pool was deeper than most pools made the pool hold more fish. Evert managed to catch the very first fish by casting a small sinko next to one of the cliffs and being picked up on the drop. 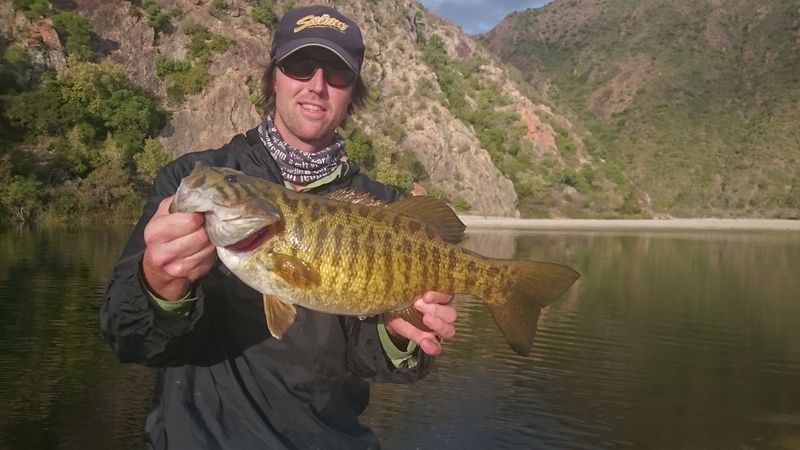 After a lekker pull and a few characteristic jumps he landed the first smallie of 1.1 kg which he followed up with a beaut 1.95 kg – a great start to the trip! 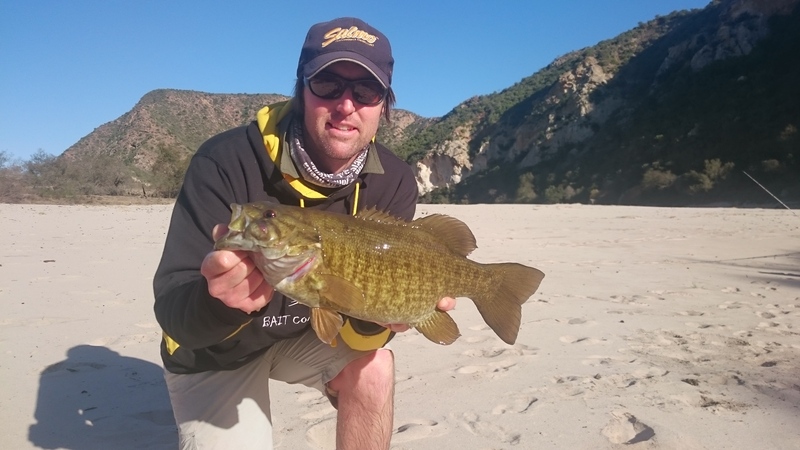 Shaun followed up with another decent smallie of 1.31 kg taken on a spinnerbait worked over a drop-off. I saw a gully formed in the rock island situated in the middle of the pool we fished. The problem was that this gully was just out of casting distance. It looked like the perfect place for a smallie to hide as there was a drop-off right next to the gully. I decided to brave the ice cold water and wade closer to the gully so I could make a few casts in it. Seeing that the water was crystal clear, it was extremely important to move as stealth as possible to reduce the risk of being seen by the fish. 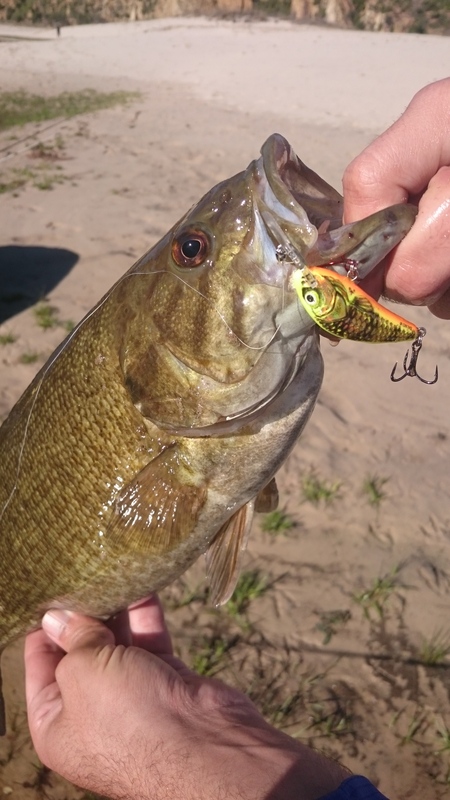 I decided to try a small Rattlin Hornet as I had a gut-feeling that this lure would be irresistible to smallies, as this lure is relatively light and we were fishing in relatively open water – I decided to use my spinning setup that would ensure maximum casting distance with this light lure. Within a few casts I was followed by a decent size smallie. I made about 30 more casts, retrieving the lure at different depths, retrieve speeds and anglers past the gully. Eventually, the smallie gave in and I went tight with a good fish. The fish gave a few jumps before I landed it. It was a nice 1.3kg job. We took a few snapshots before releasing the fish. We saw a few small carp jump in the pool; there were no signs of any other fish in the pools. We decided to move downstream towards the dam and took our two inflatables with us. The river was too shallow too drift down on our boats, thus we left our boats on the short and walked down to the dam which was a few kilometres from camp. Walking in the river proofed to be a mission as we fell knee-deep to waist-deep with almost every step we took. Walking in this sand and pushing yourself out of the sinking sand is a very tiring process. It is much better to walk on the banks of the river. Eventually we reached the dam; the bottom was made of silt which made it impossible to wade in the river. Our side of the river had little structure; the promising looking cliffs were on the other side of the river – but, it was out of casting distance. I liked the look of this water as there was a nice drop-off next to the cliffs with a few nice small trees standing on this same bank, yet we needed our inflatables to fish this stretch of water effectively. We missioned back to camp where we spent the evening session fishing the pool at Doodsklip again. 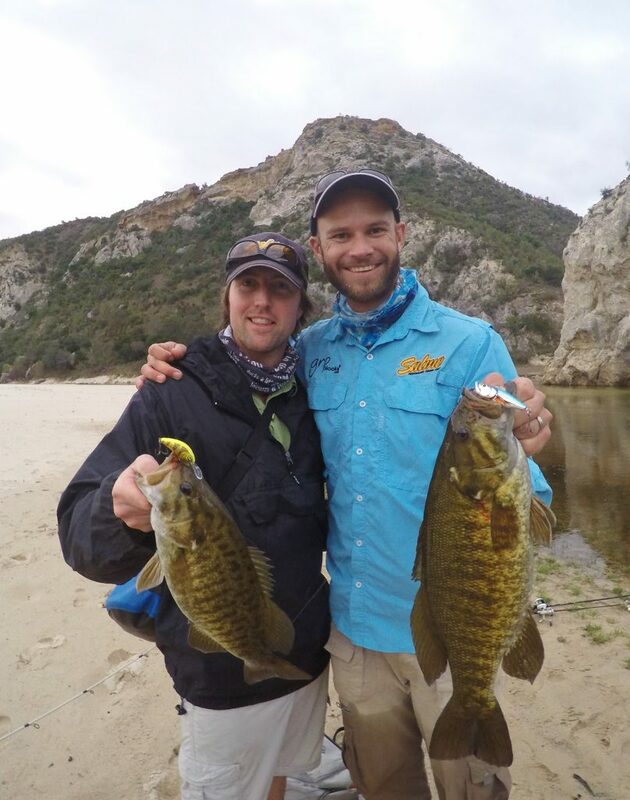 During this session Shaun and Evert managed a very nice double hook-up with Shaun catching a proper 1.83 kg job on the Salmo Pop topwater lure and Evert taking his 1.78 kg job on the Rattlin’ Hornet. I didn’t manage to get any more fish for the day, but the rest of the guys added a few more smallies to the tally which meant we ended on 11 fish for the first day of which 3 of the fish were taken on crankbaits, one on spinnerbait and the rest were taken on flukes and small sinkos. That night was super cold and we were all freezing in our tents. Fishing wasn’t easy, but we had a good first day. The plan for the next day was to move upstream towards Rooihoek to see if we could find some deeper pools.